LÖSCH GmbH has been a successful, certified manufacturer of injection moulded plastic parts for 20 years. LÖSCH standards for continuously updating to guarantee top quality. State of the art injection moulding machines with extraction robots guarantee quick production cycles. We use state of the art injection moulding machines to produce precision parts from a variety of plastics. These include technical thermoplastics as well as thermoplastic elastomers, which of course can be pigmented in various colours to suit your needs. Our finished plastic parts are more than just precision parts. We produce high quality plastic parts with different properties, looks and feels – from prototypes to small and large-scale series. Injection moulding is one of the primary methods used to process plastics. Injection moulding particularly has its advantages with large volumes. Fully automated production has cost advantages, as the parts do not need to be reworked, which affects the final price. Furthermore, the injection moulding process impresses with its high reproducibility. Our in-house mould design and production guarantee a fast track, quick response times and timely delivery of all plastics injection moulding products. And in an emergency it means tools can quickly be repaired to avoid delivery delays. LÖSCH is your expert in injection moulded liquid silicone rubber Drawing on our experience from the millions of injection moulded parts we have produced, we manufacture, produce and improve your silicone piece for a variety of applications. Our silicone experts will find the perfect silicone among over 1000 different types. Step 1: Raw granular or powder material is melted. To do so, the material is first plasticised by the turning of a screw-type plunger. Step 2: After the mould closes, the axial advancement of the plunger injects the plasticised material into the mould. The cavity in the mould creates the actual moulded part. Step 3: With thermoplastic materials, the molten mass then cools in the mould. In the case of fibre reinforced materials (duroplasts, elastomers) the mould is heated, initiating the fibre reinforcing process. Step 4: The tool is opened and the moulded part ejected. Which products can be injection moulded? The range of parts which can be produced with injection moulding ranges from micro gears or bearings all the way to large refuse containers. Our moulded parts typically weigh from 0.001 g to 1 kg. Do you have an idea for a product but need the right partner? The challenges from our customers keep us growing. Nothing motivates us as much as a project which needs a solution for implementation. Our creed: Anything’s possible. Our employees are here to support you even with complex projects. We look forward to your inquiries. Where is injection moulding used? Injection moulding is one of the key industrial processes and has become indispensable. Injection moulding is particularly ideal for producing high volumes of high-quality moulded parts relatively inexpensively. The best thing: There are virtually no limits in the shape and size. 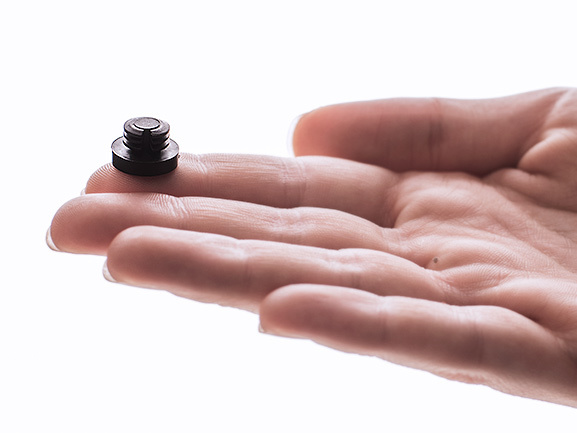 Even injection moulded parts weighing far less than a gram can be produced. What are other benefits of injection moulding? Injection moulding is an extremely economic process for producing high volumes. Even complex surface textures such as grain, patterns or engraving can be integrated into the moulds. Which materials can be used for injection moulding? Quite a wide range of thermoplastics, duroplasts and elastomers with very different properties can be used. We have many different materials in stock. Of course our experts are here to assist you with choosing the material. Contact us and share your request with us. We look forward to an initial consultation without obligation.